I had a completely different post I was planning to share with you today but real life happened and I felt the need to share it here. This blog has always been a place to inspire you to tackle your own home projects. I believe it’s just as important for you to learn from my mistakes as well. If you follow me on Instagram and you have watched my recent instastories you know we are getting all new carpet in our house. This includes the master suite and entire second level. This was a great time for me to paint all of the trim work. No need to take a chance with new carpet, right? I decided to go with a paint I love, Olympic One Paint + Primer, interior latex paint semi gloss. It doesn’t smell bad, it’s affordable, and covers very well. Now for the disaster part. 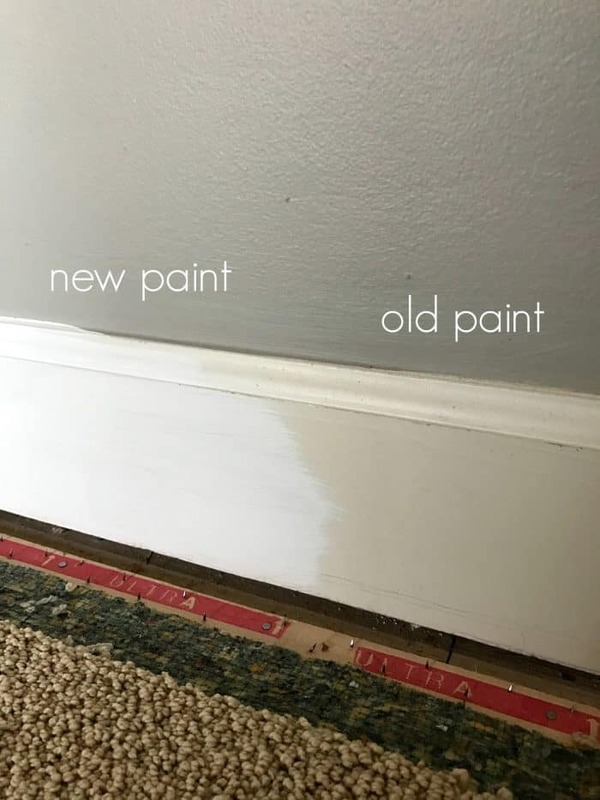 9 times out of 10 professional painters will paint all trim work with oil based paint. You can’t paint latex paint directly over oil based paint. We in fact do have oil based paint. Latex paint with primer will “sort of” stick to oil based paint. Sort of doesn’t cut it. So, for the past two weeks I have been painting trim; baseboards, crown molding and door frames. 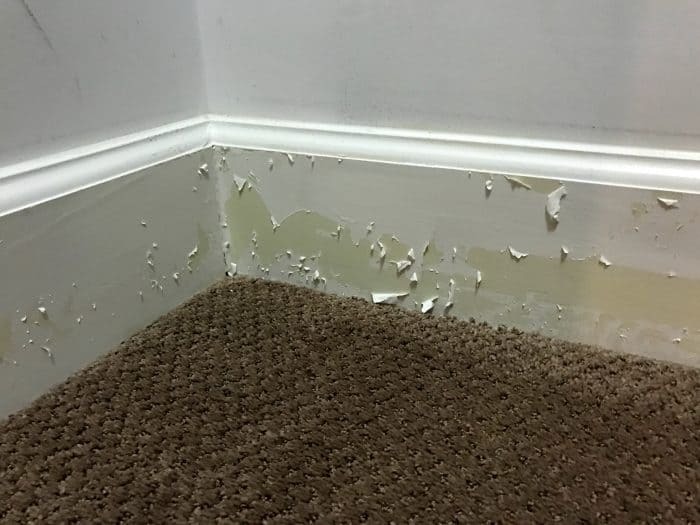 Y’all, when the installers put the carpet in yesterday my painting disaster nightmare happened. They were trying to be careful because I told them it was freshly painted. This was not their fault, I take all the blame. Sand off the paint from the baseboards. Diligently protect our new carpet. I’m not going to lie, I was devastated. Seriously, overwhelmed. I grabbed my Joy essential oil and applied it over my heart. Then I left the house and went for a walk (threw in stadium stairs just to expend all of my anger.) I always talk with GOD when I walk and he always has a way of bringing back to my place of joy. Once I was home, I admired our new carpet then really checked out all of the damage. Thankfully the hall upstairs is getting new baseboards and our sons room wasn’t oil paint so it looks perfect. There are blessings even in our misfortunes. SO, my tip for you today…if in doubt about oil paint, be safe and prime first. I’m off to sand. Bonus tip…sign up for my emails to see how this turns out, LOL. PIN this photo so you never make the same mistake I did! Bless your heart!!!! Oil based is tough and durable. It’s like every homeowner should pass the torch by letting us know! We built out house and used oil based Ben Moore trim paint per recommendation. Don’t regret it at all, but I knew. When I painted our kitchen cabinets and trim from green to white last year that’s why I dreaded it so much! Since I knew I had oil, I had to sand, prime first and sand. Luckily, Ben Moore has a new Advance line that is latex with oil properties. It’s very expensive, but amazing paint! So I’m getting my oil durability with easier future results. But…if I had not know what I was dealing with…I’d have done just like you. Hugs and prayers my friend. It’s going to be amazing when finished. I know you had a big job for sure! I’m just thankful that I don’t have to redo all of the crown molding, especially in the tray ceiling. Thanks for sharing the Ben Moore details, sounds like a fantastic product. Man… that is rough!!! I really, really feel for you. Thanks for sharing it all with us! Oh no!!!! So sorry. 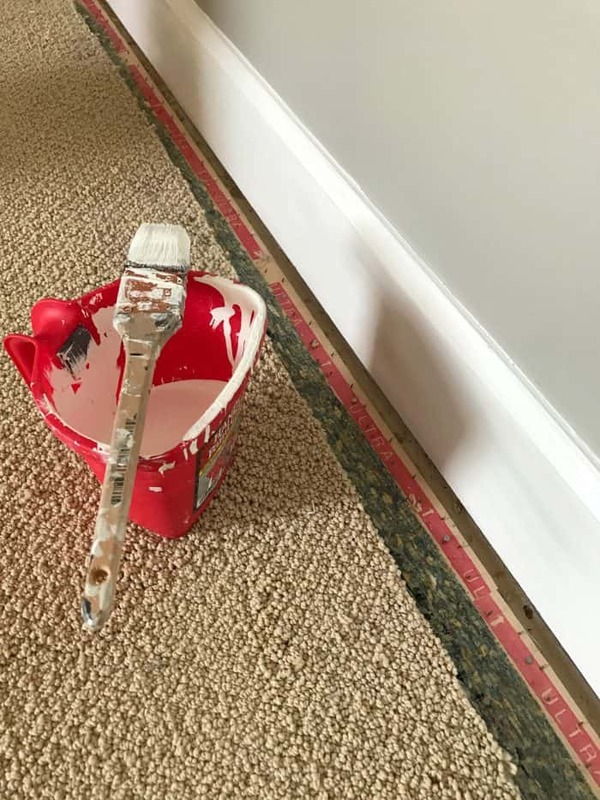 Make sure you get the tool to protect your carpet when you paint. It’s sort of a flat metal almost like a spackling knife but waaaaay longer/bigger. 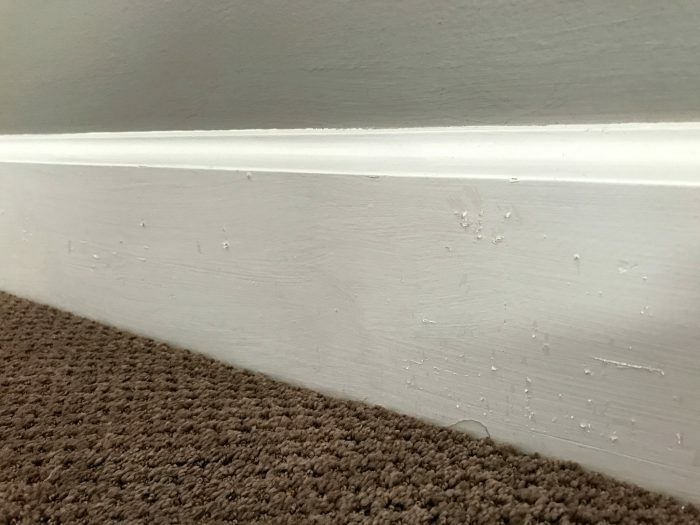 You wedge it down between the carpet and baseboard, almost under the baseboard then pull down slightly and paint the exposed baseboard. Then pull it out, move it and repeat. 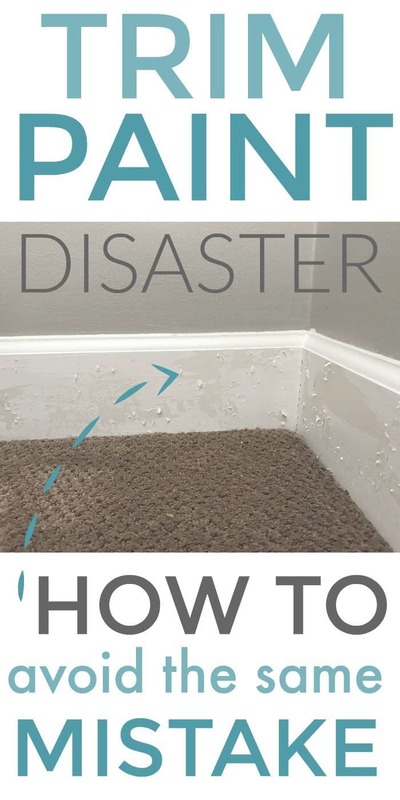 It’s super easy and will keep your carpet clean. Good luck! YES! We have one of those. I will definitely protect that new carpet. Thanks for sharing this. I’ve been thinking about re-painting some of my trim and would’ve gone with a latex paint/primer. (I don’t know if my trim was oil or latex based when last painted). Now I’ll have a better approach. This made me have heart palpitations for you. Bless you friend. Hope it turned out to beautifully on round 2! Take a cotton ball and denatured alcohol and rub it on the painted surface. If any paint comes off it’s latex, if not, it’s oil based. I had this happen to me too and it’s mess to correct. My painter knew how to test for it. Hard lesson to learn. Thanks for that tip! I had already repainted my laundry room with no issues so I had assumed it was the same. I’ll use this tip next time for sure. I’m going to add this tip into my post, thank you.